This mission marks over 200 satellites deployed into low-Earth orbit by NanoRacks since 2014. Dulles, Virginia – December 7, 2017 – Last night, NanoRacks successfully completed the Company’s 4th External Cygnus Deployment mission after commands were sent to the Cygnus spacecraft from Orbital ATK’s Mission Control at their Dulles headquarters. The Orbital ATK CRS-8 mission launched on November 12, 2017, carrying NanoRacks’ fourth mission providing opportunities for CubeSat deployment from Cygnus after the vehicle departs from the International Space Station. Prior to launch, the NanoRacks External Cygnus Deployeris installed on the exterior of the Cygnus service module with the capability to deploy satellites after the spacecraft completes its primary space station commercial resupply mission. After departing from the Space Station, Cygnus was elevated to an altitude of 450 kilometers before deploying the satellites. On this External Cygnus Deployment mission, NanoRacks deployed 14 satellites with customers including Spire, Asgardia, Tyvak, NASA’s Jet Propulsion Laboratory (JPL), and more. Also a part of this External Cygnus manifest were The Aerospace Corporation’s Optical Communications and Sensor Demonstration (Aerocube 7B/C) satellites, water-based propulsion CubeSats. Additionally of note, the ISARA and Aerocube 7B/C satellites deployed in this mission were funded through NASA’s Small Spacecraft Technology Program (SSTP), which is chartered to develop and mature technologies to enhance and expand the capabilities of small spacecraft with a particular focus on communications, propulsion, pointing, power, and autonomous operations. 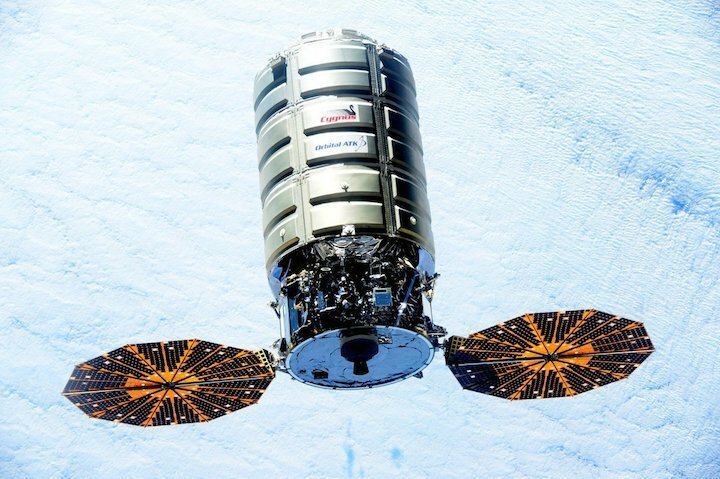 Thank you to NASA and Orbital ATK on their ongoing support for our External Cygnus Deployment program.